The STM’s board of directors passed a resolution Wednesday evening saying it wants to give Metro inspectors extra powers — making them special constables. Montreal's public transit authority wants its inspectors to have more police-like powers when patrolling the city's Metro and bus lines. The STM's board of directors passed a resolution Wednesday evening saying it wants Metro inspectors to be special constables. Making them special constables, complete with extra training, would allow inspectors to access data reserved for police officers and make them accountable to Quebec's police watchdog, the Bureau of Independent Investigations (BEI). Right now, inspectors wear bullet-proof vests, carry batons and dress in police-like uniforms. They have the power to ask for identification and issue fines for violations such as fare dodging. They also have the power to restrain alleged law breakers until police arrive. "If a client refuses to co-operate, the inspectors have the power to arrest them and hand the matter over to police as soon as possible," said STM spokesperson Amélie Régis in an email to CBC last month. The board is not pushing for inspectors to be armed and says it will hold public consultations to discuss the idea before implementing it. The plan has been in the works for several months, the board said in a statement. "These new elements of the inspectors' profile will lead to an improvement in their training and will obviously have to harmonize with the police functions currently performed by the SPVM," the statement says. "In addition, it should be noted that at no time does the STM want its inspectors to be equipped with firearms." STM board Chair Philippe Schnobb said the ultimate aim is to provide a "better customer experience." He insisted the board does not want to arm the inspectors. Giving them special status, he said, will "bring more oversight." Inspectors would be able to intervene when clients complain about unruly passengers who are harassing others. As it is, he said inspectors must witness such behaviour before detaining someone. Inspectors would also be able to detain runaway teens, he said, whereas now they can only notify police when they spot a person who has been reported missing. "The inspectors will be able to keep the person in the Metro station, for instance, waiting for the authorities to bring the person to the parents," he told CBC on Thursday. The special constable model is already used in Ottawa, Toronto, Edmonton and Calgary. 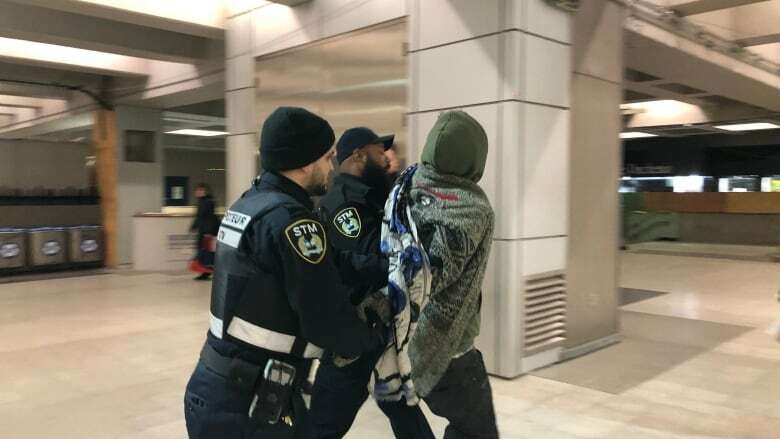 Last month, a video of STM inspectors attempting to restrain a fare dodger in the Villa-Maria Metro station by swatting at him with their telescoping batons prompted an outcry from public officials and community activists. Under increasing pressure to launch an investigation into the matter, Montreal Mayor Valérie Plante called the video footage "worrisome." She suggested increasing the police-like powers of inspectors while setting up an oversight body similar to the one in Toronto. Coun. Marvin Rotrand, a former STM vice-chair, said making inspectors special constables means they can be armed with guns, Tasers and pepper spray. The long-time city councillor is challenging the plan to up inspectors' power when, he said, there isn't much violent or even petty crime in the STM's transit network to begin with. "The Montreal Metro is very safe," said Rotrand. "There is very little crime and the police department is there when required." Inspectors are there to provide customer service and verify people pay their fares, he said.Increasing their power is not what community activists, who came out in force to Wednesday's board meeting, are seeking when they insist on more independent oversight of inspectors, he said.